No matter what style of fashion you follow, there is one accessory you absolutely must have: a belt. That may seem obvious, yet not every man really appreciates its importance. A belt does more than keep your pants up. It also completes your outfit and gives you a neat appearance. The first thing you need to know when belt shopping is your size. Belts are measured from where the strap meets the buckle to the center hole, the place where you are supposed to close your belt for the most comfort and flexibility. The general rule is to pick a length 1 to 2 inches longer than your waist size. 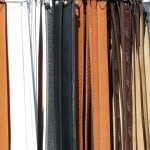 If belts aren’t an expressive accessory for you or you don’t want more than one, then buy a classic, versatile style. Otherwise, there are many types to choose from that differ not only in width and color but also in closure and material. You can also have fun with buckles to change things up without having to buy multiple belts. One of the most common questions guys have about wearing a belt is if it should match their shoes. The answer is: it depends. If one accessory is black or brown, the other should be too. The material and finish should also be the same: leather with leather, matte with matte, gloss with gloss. If you wear cuff links and tie tacks as well, they should match the color of the buckle. When it comes to casual styles or colorful belts and shoes, they don’t have to match, though they should be complementary. Adding a pop of color through your accessories is an easy way to dress down and modernize your outfit. In professional settings, your buckle should be conservative. For everyday wear, the bigger or rounder the buckle, the less formal it is. Note that a large buckle or loud belt color will draw attention to your midsection, so if you want to avoid that, then choose something more standard. When putting on your belt, start at the left side, whether you’re left handed or right handed. Don’t underestimate the power of a belt in enhancing your look and making a statement. It can be worn with jeans, shorts, or dress pants, to work or to a party. Such a versatile accessory should be a staple in your wardrobe.